The merger of two North East colleges has proved to be a “resounding success”, one year on. Sunderland College merged with Hartlepool Sixth Form College in September 2017. There was overwhelming support for the merger, which also received backing from the Sixth Form Commissioner and FE Commissioner. According to the College, a year on from the merger there have been significant benefits and the creation of new opportunities, alongside improved outcomes for students, staff and other stakeholders. The College has reported an overall increase in AS Level and A-Level pass rates and the overall pass rate for both colleges combined is an impressive 97.5%. The merger has also secured the financial future of the only bespoke sixth form college in Hartlepool and has enabled substantial new investments in the learning environment, with a brand new, state-of-the-art digital academy and curriculum launching this September. The merger resulted in a single governing board and consolidated leadership, along with new regional job roles working across both college sites for back office staff and support services. Staff at both colleges have been sharing best practice and some have progressed into newly created leadership positions. Ellen Thinnesen, Principal and Chief Executive, has overall responsibility for both Sunderland College and Hartlepool Sixth Form College. She commented: “We passionately believe in delivering educational opportunities and a high quality learning experience, with students at the heart of everything we do. It has been a pleasure working in partnership with colleagues and stakeholders within Hartlepool and across the wider Tees Valley. We look forward to this collaborative approach continuing. 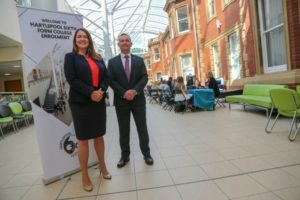 “We are delighted to report that one year on, the merger has created more opportunities for our stakeholders including students, staff and employers; ensured the future stability of Hartlepool Sixth Form College; improved performance; and enabled both colleges to meet the needs of its local people and local business community. There are currently 266 further education and sixth form colleges in England. This compares to almost 450 when colleges were incorporated in 1993. This change has seen the education sector having to transform and adapt in response to rapidly changing political and economic environments. Sunderland College is one of the largest providers of post-16 education in the North East with three campuses across the city of Sunderland and the sixth form college in Hartlepool.